What is a “novel of ideas”? 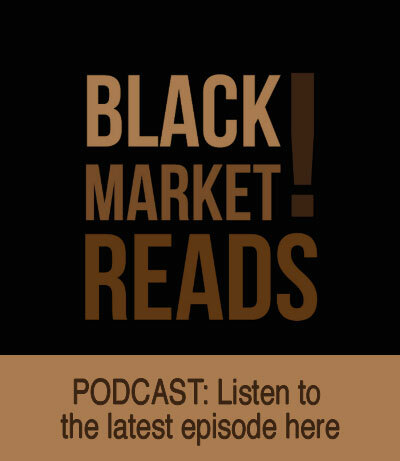 The phrase is most frequently slapped on alpha male novels, swaggering to diagnose contemporary politics and mores, stacked up with bricks of data, historical trivia, and straggling cast members, and striding eagerly towards a shaggy ambition: to encompass everything. Yet what could be further from the world of ideas than a gluttonous story, eager to swallow the world? And, to tip-toe this argument a step further, what could be more antithetical to an idea than an actual story, less fresh and novel than the novel, that aggregator of empirical life and proper nouns, with every prop nailed firmly into this time and that place? Speaking as one who has long preferred books that levitate, buoyed up by ideas, what I would like is a genre of books about nothing, one that possesses zero time and zero place. As you may have guessed by now, Morrison is a prolific inventor and, unlike most fiction writers, he does not see his job as the layering of details. 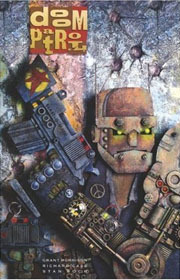 In fact, reading Doom Patrol reminds one how much conventional novels are really about logistics. And while Doom Patrolwould have been disastrous as a novel, the comic form gives a visual specificity to a story that essentially avoids a setting and a focus on things. 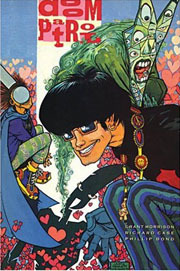 Most of Doom Patrol is drawn by Richard Case, whose dilapidated style possesses enough earth to ground Morrison’s vamping and enough wonkiness to animate Morrison’s cheerful lack of empiricism. 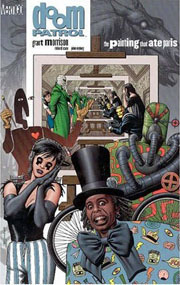 Morrison may explore a theme like the sublime, but you never sense that he’s searching to understand a given topic; his themes, rather, are conceits through which he can course his thoughts like electricity.Doom Patrol, for example, is an anti-dualistic comic: Morrison seems bored by the value-trapped bipolar world of heroes and villains, particularly when the Doom Patrol faces the Brotherhood of Dada, whose absurdist antagonists seek nothing more than to liberate the world from tedium. And the members of Doom Patrol even expostulate on their anti-dualistic postures, like Rebus, who is both man and woman, black and white, and Robotman, who argues with his metal body. One suspects Morrison sees his throw-in-the-kitchen-sink pastiche as a way of enlarging his work, which pinballs from high to low culture, and from future to past. But because Morrison’s goal is to explore a diversity of styles rather than things, and because he does not develop a single style, a style so natural that it no longer seems a style, Morrison is an ironic aesthete, not a fecund storyteller like Tolstoy or Dickens (or, more appropriately, Kirby/Lee on Fantastic Four or Claremont/Byrne on Uncanny X-Men). 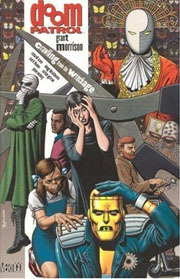 For some readers, then, Doom Patrol will seem too inorganic, arcane, and apathetic about character. (Morrison, incidentally, writes characters not as selves, but as quotations from different literary styles.) Yet I think Doom Patrol is a personal comic, but personal the way a poem, rather than a novel, is personal—in its aesthetic. 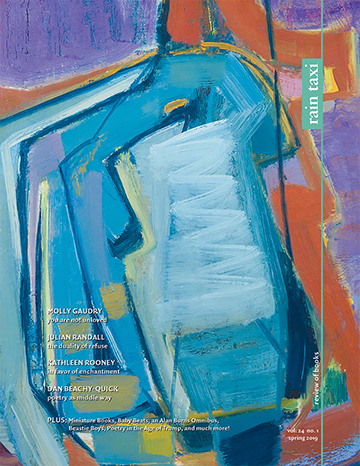 As with the New York School poets, you are always aware of how much fun Morrison is having jolting the page with ideas. His mind lights up in vigorous sparks, illuminating Doom Patrol with an idiosyncratic human smallness, much like the novels of Flann O’Brien (whose At Swim Two Birds is, like Doom Patrol, fascinated with the color green), the fictions of Donald Barthelme, or even—work with me here—the short stories of V.S. Pritchett.